Most religions have one holy book. But Hindus, Buddhists and Jains seem to have an abundance of scriptures – literally hundreds of them. Why don’t Hindus have just one Holy Book? 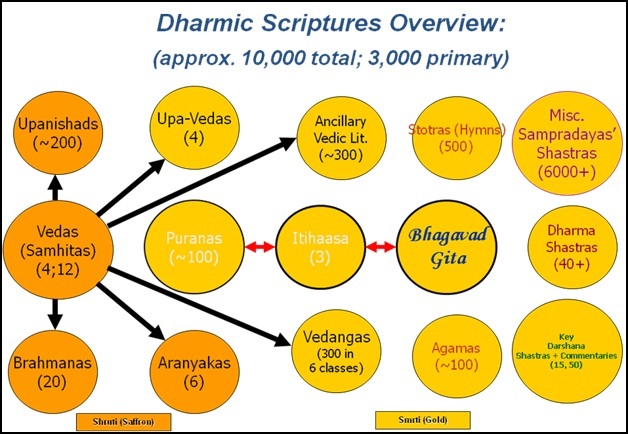 Why do Hindus have so many Scriptures? Most religions have one holy book. The Sikhs have the Adi Granth, Christians have the Bible (which is a collection of 66 books plus a few more in the Catholic version), Muslims have the Koran and Jews have the Torah. But Hindus, Buddhists and Jains seem to have an abundance of scriptures – literally hundreds of them. Why don’t Hindus have just one Holy Book? Rishi Bharadvaja was amazed, and asked Indra to show him the true path. Indra recommended him to worship the Divine in the form of the Sun through a special religious ceremony. He said that worshipping Bhagavān was equivalent in merit to mastering the three mountains of sand worth Vedic knowledge. 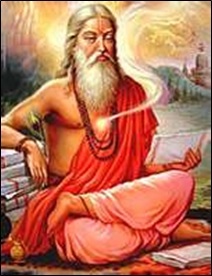 Rishi Bharadvaja followed Indra’s advice, and attained Moksha. He realized that there is no end to studying the scriptures. At a certain point, we should focus more on applying their teachings. There is a lot of wisdom in Hindu Dharma, and this requires many books. Hindus have been blessed with a continuous string of saints and sages for several thousands of years. These great men and their disciples have collected their teachings resulting in a vast number of sacred writings. It is similar to the fact that the entire knowledge of Physics cannot be captured within a single book these days. So also, the entire wisdom of Hindus cannot be incorporated in just one holy book. Hindu Dharma is the most ancient faith in the world. It is expected then that it has had the longest period of time to churn out more holy writings than others. This is another obvious reason why Hindus have so many scriptures. The core scriptures of other religions originated in a very small area whereas the core scriptures of Hindus were compiled in a much larger region, resulting in Hindus having a lot more holy writings than many other faiths. To get a perspective, most Hindu writings originated in different parts of the Indian subcontinent, a region that is dozens of time larger than Israel (where the Jewish and Christian writings arose) or Hijaz (where the Koran originated). This too has resulted in the large number of Hindu scriptures. Hindu Dharma recognizes a diversity of beliefs, doctrines and practices. It is not a ‘one size fits all’ or a ‘my way or the highway religion’. To reach these diverse perspectives, Hindus have multiple books. This explains why Hindus have multiple schools of philosophy, each with their own set of scriptures. Hinduism also permits the worship of God in many different forms and also as a Formless Supreme Being. Many different scriptures contain instructions on the proper procedure for worshipping these different forms of the Divine. For example, the Vaishnava Pancharatra texts have details on worshipping Lord Vishnu, whereas the Shaiva Agamas contain instructions on worshipping Lord Shiva. The multiplicity of worship amongst Hindus has also contributed to the diversity of Hindu scriptures. Hindus recognize the fact different people are at different levels of mental capacity, spiritual attainment and temperaments. To cater to people of different calibers, Hindus have different scriptures. For example, the Purāṇas are more user-friendly and are geared towards Hindus who might not have the competence or temperament to study the more difficult Vedas. This is just like the fact that students use different textbooks for the same subject (say, Chemistry) in different grades in their schools. Hindus also tend to have different scriptures to discuss different topics instead of lumping all topics and branches of learning into a single book. For example, just as students have different textbooks for Physics, Chemistry and Biology, Hindus too have different scriptures to explain to them the principles of ritual, devotion, wisdom and so on in separate books. If the wisdom of Hindus were not great in extent, it would have been possible to combine all these different writings into one collection. But individual Hindu scriptures can also tend to be very vast. E.g., the Vedic literature is six times the length of the Bible. Hindus do not have a central authority that regulates what is scripture and what is an ordinary writing. In other religions such as Islam and Christianity, there too existed many versions of scripture in the past, but central councils of scholars met to stamp out diversity of holy writings and mandated only one particular version of their scripture as authorized or acceptable. For example the Council of Nicea in 325 CE suppressed several alternate versions of the Bible and approved only one that is similar to the version available these days. Similarly, the second Islamic Caliph Othman ordered destruction of several divergent versions of the Koran and allowed only one to circulate. In contrast, Hindus accept diversity and the original four Vedas developed into hundreds of different branches that differ slightly from each other. Hindus consider all these versions as authoritative because of the realization that all these branches teach the same principles, even though in a slightly different language. Hindus explain the multiplicity of our scriptures through the dictum that “The Truth is One, but the wise teach it in many different ways” (Rigveda 1.164.46). Hindu Dharma is not tied to a particular period of time, or to a particular founder of the Hindu religion, or to a last Prophet or the only son of God. Hindus believe that although the Vedas are held to be the gold standard because they were intuited by spiritually realized Rishis, there are many other writings that contain the teachings of Saints, Sages and scholars who were also divinely inspired. Hindus believe that at any given point of time in history, it is possible for a spiritual person to attain great heights of realization which the Vedas talk about, and the writings of such great men then assume the form of scripture, because they reflect the spirit of the Vedas and other holy books. Hinduism relies a lot on personal teaching by a Guru. Much of Hindu scriptures have been passed on from generation to generation through the medium of instruction from Guru to his disciples. Several Gurus have added their own commentaries and explanations to the scriptures to explain their meaning more effectively. Or they have compiled their own versions of the scripture to cater to the needs of their own disciples better. This has lead to several versions of the same scripture, and Hindus do not have a problem treating these different versions and commentaries as sacred writings. Hindus also believe that several scriptures such as the Dhamashastras do not have eternal validity because of changed social conditions. Therefore, new scriptures are codified to apply the Vedic principles so that they suit the new conditions better. For example, it was believed by some Hindus that the Manu Smriti was applicable in more ancient times whereas the Parashara Smriti is applicable in the present age according to some Hindus. In many cases, one holy book of the Hindus has been split into many for the convenience of the readers. For e.g., Hindus believe that the Vedas were one holy book which was split into four Vedas (Rigveda, Yajurveda, Samaveda and Atharvaveda) for the convenience of students by Veda Vyasa. In contrast, Christians have combined 66 books written by different people and during different times into a single book called the Bible. The final reason for such a large number of scriptural texts in Hinduism is the fact that Sanskrit, in which the most ancient writings of Hindus were composed, ceased to be a popularly spoken language in the last 2000 years or so. Therefore, Saints who were filled with compassion wrote versions of several popular ancient Sanskrit scriptures in the vernacular languages prevalent amongst Hindus in their region. E.g. the Rāmāyaṇa of Vālmīki has been rendered into Tamil, Hindi, Marathi, Bengali, Telugu and numerous other languages by Saint Poets and is widely read with reverence by Hindus today. Having multiple scriptures can sometimes make the task of reading them daunting for most Hindus. Therefore, there are some scriptures that are believed to contain the main teachings of all the other scriptures. E.g., the Gita is said to be the essence of teachings of spiritual scriptures such as the Upanishads. It is recommended that if one can read only one Hindu scripture, then let it be the Bhagavad Gita. Or Ramayana. Or Bhāgavata Purāṇa. Intellectual minded Hindus also like to read the Upanishads today. 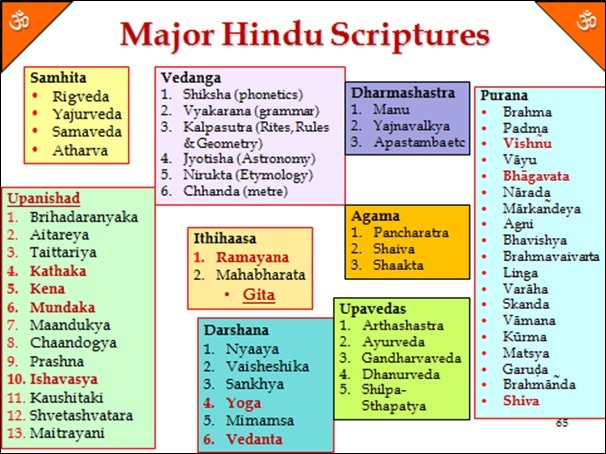 In the chart below, the scriptures that are commonly read by ordinary Hindus are shown in the red font.